Synopsis: An American named Daniel Shane is tramping it in wartime Britain. He breaks into a darkened house and helps himself to the contents of the pantry. He is startled by Leslie, the lady of the house, who doesn't seem alarmed by his presence -- in fact, she seems surprisingly eager for him to stay. She says she wants to hire him for a job. It turns out there's a murder victim in the study upstairs, a man with a knife in his back, and she wants Shane to dispose of it for her. Needing the money -- as well as taking a shine to her --he gamely agrees, and makes the body disappear. But when he comes back to the house the next day he finds the murder victim is back where it was before. Comments: Apart from the rather generic title, there really isn't any reason why this wartime espionage thriller got tossed into the Shock! package of horror films. 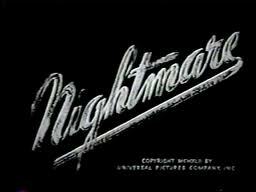 But as it turns out, Nightmare is a pretty good little movie, with a story reminiscent of Hitchcock's The Thirty-Nine Steps, albeit with a somewhat more hard-bitten world view. Shane isn't the typical Hitchcockian innocent who's in the wrong place at the wrong time. He is perfectly willing to engage in a bit of illicit activity to keep body and soul together (although, somewhat improbably, he tells Leslie that he's on his way back to the States to join the American war effort -- a bit of dialogue presumably tacked on to satisfy wartime censors). The scheme hatched by the Nazi spies is pretty silly stuff (they're manufacturing exploding bottles of scotch, or something) but it hangs together just well enough to get us through the end of the movie. It doesn't hurt that Nightmare features snappy dialogue and engaging performances by Brian Donlevy (who later starred in the Hammer Studios' versions of The Quatermass Xperiment and Quatermass II) and Diana Barrymore. Barrymore is particularly striking here, carrying herself with a confident, almost aristocratic bearing that is undercut at crucial points by Leslie's uncertainty about whom to trust. 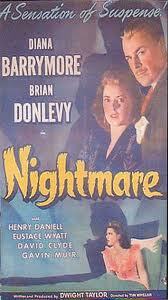 This is one of the few films that Barrymore made. 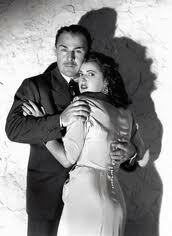 Universal had hoped to cash in on her famous name (she was the estranged daughter of John Barrymore). 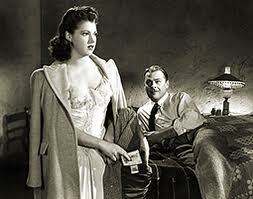 When she didn't pan out as a box-office draw they offered her a role in an Abbott and Costello film. She turned it down, and they cancelled her contract. Nightmare is pretty much forgotten today, but I will now wave my magic wand once, twice, thrice -- and confer upon it the status of Minor Classic. It doesn't appear to be available on DVD, but if you get a chance to see it, it's worth a look.